Swiss scientists have discovered a new protein with antibiotic properties in a mushroom that grows on horse dung. The researchers from the Institute of Microbiology at ETH Zurich are now exploring the various potential applications. Microbiologists and molecular biologists at ETH Zurich and the University of Bonn, Germany, say the new agent is known as copsin. Their findings have been published in the Journal of Biological Chemistry. They say it has the same effect as traditional antibiotics, but belongs to a different class of biochemical substances. Copsin is a protein, whereas traditional antibiotics are often non-protein organic compounds. 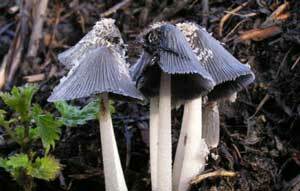 The researchers, led by Markus Aebi, professor of mycology, discovered the substance in the common inky cap mushroom, Coprinopsis cinerea, that grows on horse dung. When they began their research, the scientists were interested in understanding how the fungus and various bacteria affect each other’s growth. This involved cultivating the fungus in a laboratory along with several different types of bacteria. It was found that C. cinerea was able to kill certain bacteria. Further research showed that the copsin was responsible for this antibiotic effect. For Aebi, the main focus of the research was not primarily on applications for the new substance. “Whether copsin will one day be used as an antibiotic in medicine remains to be seen. This is by no means certain, but it cannot be ruled out either,” he says. He is much more intrigued by fundamental questions, such as how fungi have used defensins and other naturally antibiotic substances for millions of years to protect themselves against bacteria. Why does this work for fungi while humans have been using antibiotics in medicine for just 70 years with many of them already becoming useless due to resistance? “Fungi have internal instructions on how to use these substances without resulting in selection of resistant bacteria. How to decode these instructions is an intriguing problem for basic research,” explains Aebi. Andreas Essig, a postdoctoral researcher in Aebi’s group and lead author of the study, is currently exploring potential applications for copsin, which has been registered for patent approval. It was the biochemical properties of the substance that led the scientist to do so. “Copsin is an exceptionally stable protein,” Essig says. Proteins are generally susceptible to protein-degrading enzymes and high temperatures. Copsin is an exception because it also remains stable when heated to a temperature of 100 degrees Celsius for several hours or when subjected to protein-degrading enzymes. The researchers believe that the protein has these properties because of its extremely compact three-dimensional structure, as analysis has shown. The researchers were also able to unravel the exact mechanism of action, discovering that copsin can bind to lipid II, an essential building block for the cell wall of bacteria. “Building the cell wall is the Achilles heel of bacteria,” explains Essig. If copsin binds to lipid II, the bacteria die because they are unable to build new cell wall. In addition to being used as an antibiotic in medicine, it may also be possible to use copsin in the food industry as well. This is because copsin kills many pathogens, including Listeria, a type of bacteria that can cause severe food poisoning and is a concern in the production of non-heat treated foodstuffs such as raw milk cheeses and dried meats.